Two records in Calflora. Also in about 10 other US states and Ontario, Canada. USDA, ARS (2016). Germplasm Resources Information Network (GRIN). Present in California, Utah, Colorado, Washington, which match California. On US Federal noxious weed list. Invades 60 square miles in one county in Utah. On Washington noxious weed list but the information is unclear about how widespread it is or if it's more of an alert species for prevention. USDA NRCS (2015). PLANTS Database. CDFA (2015). California Noxious Weed List. Yes, invasive in Utah, which matches California. Galega orientalis listed by Randall 2012 as invasive based on reports from Estonia and the Upper Volga Basin, Russia, but these are not similar to California. 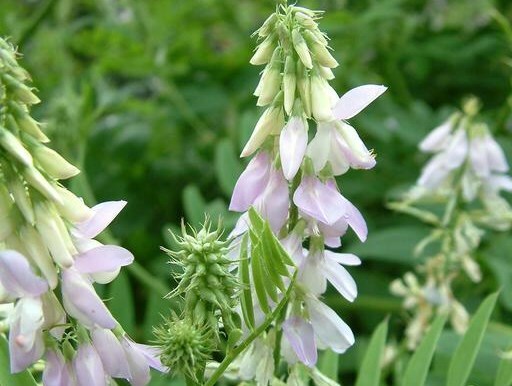 Galega officinalis forms dense thickets and competes with and reduces yields of forage plants. Can grow up to 2m (6 ft) tall. Did not find any mention of this. Whitson, T.D.. (2001). Weeds of the West. Galega officinalis forms dense thickets and competes with and reduces yields of forage plants. Can grow up to 2m (6 ft) tall so it seems like these could be impenetrable. Does not sound like it. Reproduces by seed. Pods contain up to 9 mustard colored, oblong seeds. Each plant can produce 15,000 pods or more. Goatsrue seeds typically remain dormant until scarified and may remain viable for ten or more years. See the CDFA blog entry cited in Evaluation Notes. This is a new species added to the noxious weed list in 2015. CDFA (0). CDFA's Division of Plant Health's Pest Ratings and Proposals. Seeds can be spread in animal manure. Seeds are spread primarily in irrigation water. Seeds can be spread by contaminated harvest equipment, soil equipment, animal manure, or alfalfa seed. CABI - http://www.cabi.org/isc/datasheet/24756. Last modified 20 Jan 2015.